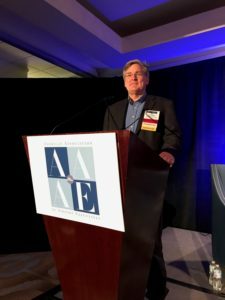 ELERTS was named the winner of Airport Shark Tank at the 17th Annual AAAE / TSA / DHS Aviation Security Summit December 6, 2017 in Arlington, Virginia. During Airport Shark Tank, five innovators presented their airport security products on stage and were judged by four leaders in the airport industry, along with hundreds of airport and government security executives who voted for the most innovative new airport security technology solution. ELERTS presented its See Something Say Something mobile app as a key component to the airport threat and security ecosystem. ELERTS app helps protect against internal and external threats in public and sterile areas of an airport. Whereas the use case for ELERTS See Say app at transit agencies involves passengers being the primary app users, at airports the app is targeted for use by badged airport employees, vendors and service providers who are most familiar with the airport and who recognize when something looks out of place or suspicious. As the winner, ELERTS receives a slot in the Airport Market Match program, an Accelerator service targeted at gathering rapid feedback and airport piloting opportunities. Download ELERTS Shark Tank presentation. See what our CEO had to say about the Shark Tank experience. Learn more about ELERTS airport solution.